As soon as I was sent a press release from Northern Ballet about their new production – Dracula – I KNEW I had to get my hands on some tickets. I absolutely adore the ballet. I think it’s incredibly beautiful, and Northern Ballet is one of the best companies, in my opinion. They seem to have a very loyal stable of dancers who I am excited to see year after year. Over the last few years, I’ve been treated to The Nutcracker, Cleopatra and Cinderella, to name a few (I was devastated to miss The Great Gatsby); and each performance has blown my tiny little mind. For real. This is another hobby that Momma P and I ‘cultivate’ together – a Christmas ballet has become a tradition, and this year, I’m very much looking forward to Northern Ballet’s Peter Pan, but for now, let’s stay with Dracula. The blurb reads: A creature who should inspire repulsion in every living thing but who has seduced countless generations, Bram Stoker’s legendary vampire lives on in this extraordinary ballet. 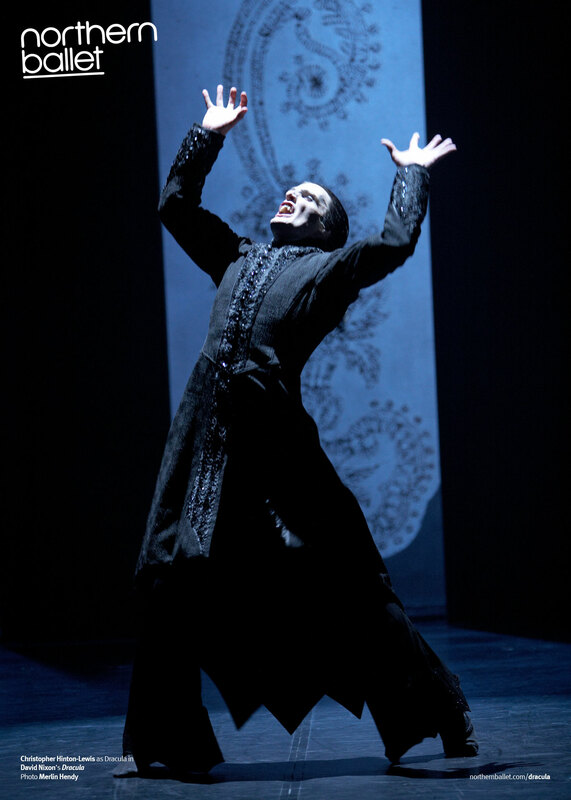 The dark tale of the immortal Count is played out through Northern Ballet’s unique blend of sensuous dancing, gripping theatre and gothic sets and costumes. Californian Martha Leebolt and Liverpudlian Pippa Moore are two of their Premier Dancers, who I’ve really enjoyed watching over the years, and last night was no exception; while NB is simply spoiled for choice in male dancers. One of Momma P’s and my favourites is Hiraonao Takahashi, but last night we were blown away by Kevin Poeung, who played Reinfield. He has an incredible style of dancing that is very individual. He was mesmerising and stole the stage every single time he was on it. He’s due to play Peter in Peter Pan, so I’m even keener to get tickets for that! Also, special shout out to the dancers who played Dracula’s wives! You can’t talk about Northern Ballet without mentioning David Nixon. He’s the Artistic Director, and has basically turned this company into the powerhouse you see today. His talent is behind every single plie and arabesque, but to be honest, we’ve never seen a bad performance, and even if you don’t manage to score tickets to this (it’s only at the West Yorkshire Playhouse until September 13th), there are lots more you can catch. Elves and the Shoemaker, and Three Little Pigs are both a great introduction for kids; they’re still touring The Great Gatsby, and Cinderella; Peter Pan is this year’s Xmas offering, while we can expect Romeo and Juliet and Wuthering Heights next year. I can’t wait!